We are now well and truly into Spring in the UK, and I must say it is a joy to see all the bulbs flowering in the gardens and at the roadsides. Quite a bit of my time over the past month was spent preparing the June edition of the Shropshire FHS journal. This has now been “put to bed” and is with the printers. I’ve continued with the ongoing process of updating my family history files, mindful of the need to update the Geoffs Genealogy website as soon as I feel that I’ve done as much as I can. An email from Ginny a few weeks ago, set me off researching the McRodden line. The McRoddens entered into the Bankes Pedigree in 1897 when Thomas David McRodden (abt 1875 – 1912) married Mary Ellen Jones (b 1876). Mary Ellen was a Bankes descendant, being descended from Joseph Rand, half brother to John Bankes. She was a daughter of John Jones & Mary Rees – you can find the family on their tree on Geoffs Genealogy if you are interested. Anyway, after a few nights spent researching on the internet I now know that Thomas D McRodden was Irish, being born at born in Balbriggan, Dublin. I have traced eight children of this Thomas & Mary, and in some cases I’ve been able to trace their descendants. All very pleasing. Another twig on the tree! The McRoddens lived in South Wales, in the Cardiff area, and my research suggests that there may still be some members of the family in that area. Speaking of South Wales, last weekend we went to Carmarthenshire – an area we often visit to enjoy its lovely scenery and tranquility. On this occasion we visited Llanegwad church, seeking some monumental inscriptions. We have a number of relevant burials records that we obtained from the parish registers, and had visited this graveyard before, but had no success in our search. Nevertheless, we thought we would give it another go. Well, I’m sorry to say that the state of this graveyard was very bad indeed. I understand the modern trend towards treating a churchyard as a nature reserve, although I don’t agree with it, but I have to say that this is quite the most unattractive graveyard I’ve ever visited. 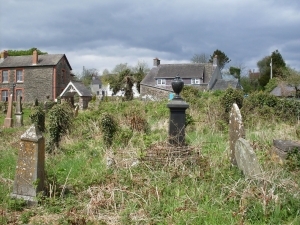 The photo gives you some idea of the problems we family historians face when searching for a grave there. Needless to say, our search was fruitless, and sadly we cannot see any point in trying again. During the past few weeks I’ve also managed to fit in a bit more research on one of my Lancashire lines. John Cross (abt 1820 – abt 1868) married Elizabeth Culshaw (abt 1823 – 1864) in 1843 at Penwortham, just outside Preston. They had eight children, and I have been piecing together the lines of descent from one of their sons – Robert Cross (1856 – 1908) and his wife, Mary Carr (abt 1854 – 1931). Mary Carr was born at Birkdale, near Southport, and this was where the family settled. To my knowledge they had ten children, and I’ve managed to trace a lot of information about them and their descendants. All very satisfying. I have found the 1911 census extremely useful in this and other research. It is great to be able to gain information telling us how many years the people on this census had been married, and how many children they had had, and to be able to use this information to firm up our research. Also, when you look at these forms you are seeing the actual signature of your ancestor. A rare treasure indeed! Another resource well worth looking at in your research is Google Street View, which is available from Google Maps. By using this facility you may be able to see the actual street or building in which your ancestor lived. Of course, this is not always possible. Many of our forebears’ homes have been demolished, and even if they still exist it may not be possible to identify the correct house because of changes to the house numbering system. However, a search of Google Street View can often pay off, so it is definitely worth a shot. The last resource I want to remind you of this time is the Times Digital Online Archive. This is a subscription service, and it is probably unlikely that you will want to subscribe. However, it is worth asking your local library whether you can access this website via their website, as many libraries subscribe and make The Times Digital Online available to its readers free of charge. If you can get access in this way you will be able to search 200 years of The Times newspaper – invaluable as a source of information about the life and times of your ancestors, and if you are lucky you may find an ancestor mentioned. In my experience the quality of the indexing is very good. I think that’s enough for now. Good hunting!